COLOMBO MUSEUM IN SRI LANKA HAS GOOD BRONZES OF Lord Nataraja and Tamil saints Appar, Sundarar, Sambandar and Maniikavasagar. Parvati’s statues and Kathirgama Karthikeyan are also remarkable pieces. Interesting stories about elephants are found in Indian literature. Like the Indian elephants that travelled up to Rome 2300 years ago, Indian story about six blind men’s encounter with an elephant also travelled to different parts of the world. John Godfrey Saxe (1878) wrote an English poem on it. Ascetics have mysterious powers. They can control animals. Hindu literature is full of anecdotes about animal miracles. In the vicinity of ascetics both the tigers and deer (natural enemies) drink water from the same river undisturbed, say Sanskrit and Tamil literature. When a Hindu enters Sanyas Ashrama (ascetic life), he takes an oath standing in the water that he wouldn’t harm any living being on earth. Hindus are always one step ahead of others. When they take the oath they say by word, deed and thought no harm will be done to anyone. If anyone does this that person develops miraculous powers. We have several miracles of controlling mad elephants by Mantra, Tantra and heroism in Tamil and Sanskrit books. When Krishna was invited by Kamsa, along with his brother Balarama, to a wrestling bout, he arranged an intoxicated elephant at the gate of the arena. The two brothers saw the elephant at the gate, with the rider at the top; and the rider suddenly marched on to the brothers. Krishna, having accepted the challenge, broke the tusks of the elephant and hurled the elephant into the air. It was killed instantaneously. Its name was Kuvalaya Peetam. 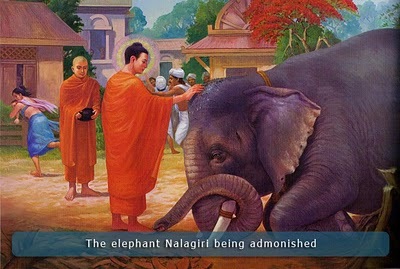 Taming of an elephant called Nalagiri by the Buddha comes in Culavagga (VII-2-5). Devadatta sets upon the elephant against Buddha. This is very similar to Krishna’s taming of an elephant set upon by Kamsa. When Buddha looked at the elephant with a fixed but calm gaze the elephant was calmed down. One can answer the question who copied whom? Easily. Since Buddhism was a proselytizing religion unlike Hinduism, Buddhists copied Ramayana Story, Mahabharata Story, Sibi Story and many more to attract the Hindus into its fold. They attributed all the Pre Buddha stories to the Buddha and told the people Buddha was born in these forms in his previous births. Appar’s other names are Marulnikkiyar, Tirunavukkarasar and Vageesar. When he was converted to Jainism, he was named Dharmasenar. After his reconversion to Hinduism he was subjected to lot of ordeals by the Pallava king Mahendra Varman (600-630 AD). At the instigation of some jealous Jains he was thrown in to sea and a burning kiln, but he escaped unharmed. Lastly a mad elephant was sent to kill him. Here are the words of Sekkizar in Periyapuranam about the elephant encounter: “At the king’s command an elephant the size of a mountain came rushing out. The elephant attacked and trampled upon everything on its way. It outdid even Yama, the God of Death. Knocking down walls and verandas in its path, it finally emerged into a wide open square. It was driven towards Appar. But quite unafraid he meditated on the golden feet of Lord Shiva. With heartfelt devotion he sang in praise of the Lord. The elephant walked reverently in a circle round him, then bowed before him to the ground in worship. When the mahouts tried again to drive it in the direction of Appar, it threw all of them to the ground and killed them by the score. The king was totally dismayed. At the end the king himself was reconverted to Hinduism. It happened around 600 AD in Tamil Nadu. King Udayana of Vatsa Kingdom (6th Century BC) was fond of elephants. He was such an expert in playing the Veena that he can tame even wild elephants with his music! Lord Indra gifted him a divine elephant, which left him because of a mistake he committed. Shocked, he went in search of it. Meanwhile, he met a princess, Vasavadatta. The two fell in love and faced many problems. Both of them were separated like Rama and Sita and at the end they met again and lead a happy life. His elephant came to his rescue when he was in trouble. “ The Lord of the country, where, on hearing the huntress who was drying her hair tresses sings the Kurinjippan ( a tune of hill country), the war loving young elephant stood motionless without eating the corn sheaves, closed its eyes and fell fast asleep”. “Just as the turbulent king elephant that evades and does not mind the iron hook of the mahout voluntarily submits itself to the sweet sound of the lyre”. In Perunkathai, a Tamil translation of Brhatkatha, we see how an elephant became a slave to Udayana’s lyre and came to his rescue when he was in trouble. Ancient Indians were keen observers of animal behaviour. They studied animal psychology even before Freud and Jung and even wrote about animal dreams. I have dealt with these themes elsewhere in my posts. Source:-A book on Paramacharya by name Ganni by Sri Sudarsananda-published by Sri Bhagavat Seva Ashramam,TriplicaneApril 1986. Once when Periyava (Shankaracharya) was camping at a place PUCHAMALAIKKUPAM, the shed where the Mutt’s elephant was kept got fire and the elephant broke its chain and ran away. Next day morning the employees of the mutt noticed that the shed where the elephant was kept was burned down fully and the elephant was missing. Later it was found that the elephant was near a tank some five miles away and the mahout went there to fetch the elephant but the elephant refused to accompany him despite great efforts. 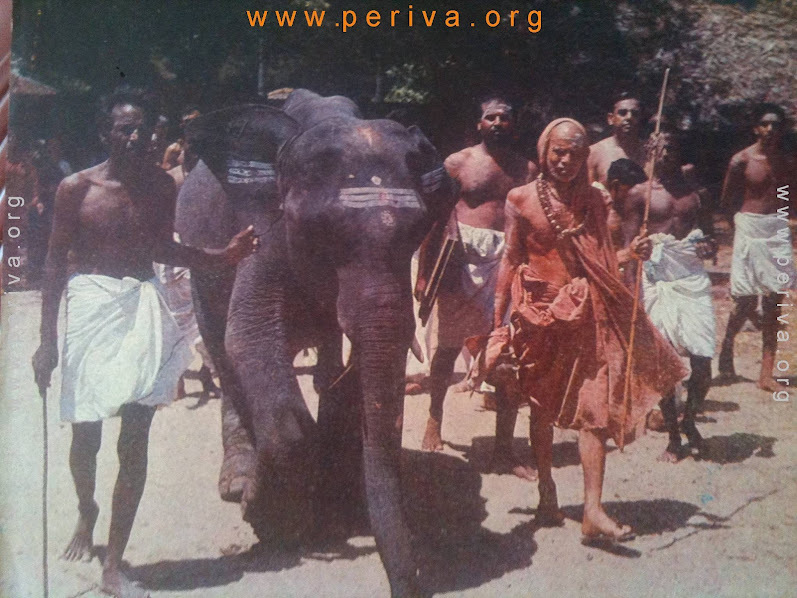 Then Periyava went there and the elephant slowly got up from the tank and came near Swamiji and saluted him. There were few burns on the body of the elephant. Swamiji patted the elephant with HIS own hand and ordered that proper treatment for burns should be done. 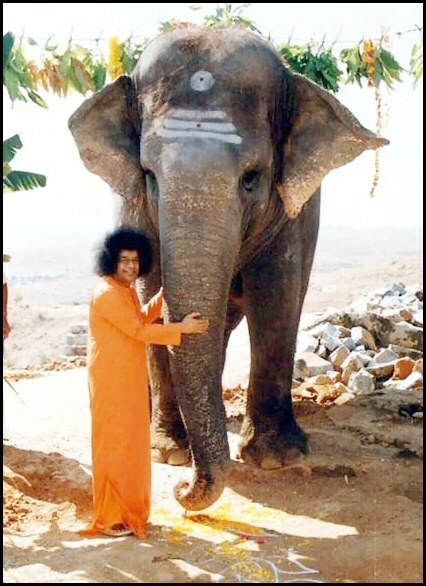 On another occasion also, when the elephant refused to move, Swamiji was informed. He came patted the animal lovingly. The elephant acted normally from the minute Swamiji touched it. Others were too scared to go near the elephant. It would interest here to note that in ancient times, the royal elephant was let loose in order to find a suitable successor for the throne that was rendered vacant by the death of a king who died without a heir. The story goes that Tamil kings Karikal Choza and Murthy Nayanar were elected as kings in the above manner. In the North we see elephant helping King Udayana this way. Also read 200+ Tamil Proverbs on Elephant posted already in this blog.